Steel twin screw turbine steamer, built and engined by Denny’s of Dumbarton (Yard No. 1015) for the South Eastern and Chatham Railway, in 1914. Engines: 4 Denny/Parsons steam turbines in two independent sets, each working one of the twin-screws. 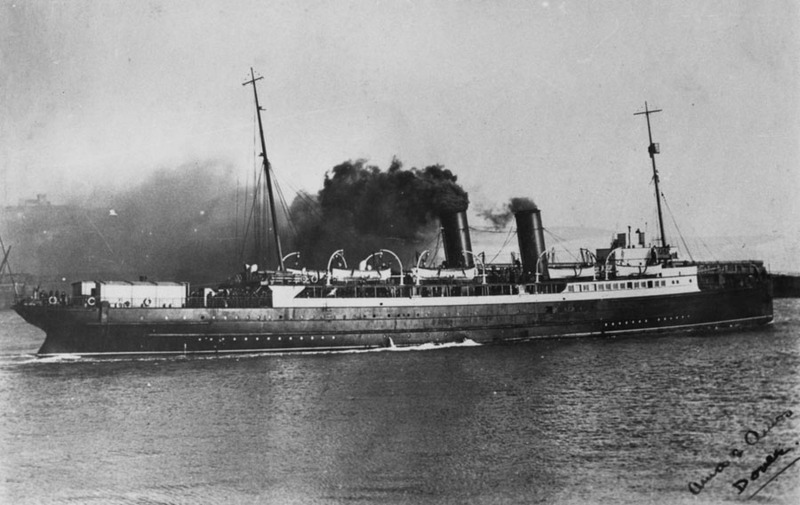 Together with her sister ship, the MAID OF ORLEANS I , BIARRITZ was ordered just before the outbreak of war in 1914 (cost not to exceed £111,000), and both vessels were still on the stocks when hostilities commenced. A small difference in outward appearance from their predecessors consisted in the funnels having deeper black tops. Later the cowls would be removed and still later new funnels were substituted with tops as deep as those on vessels of the other sections of the Southern Railway fleet. 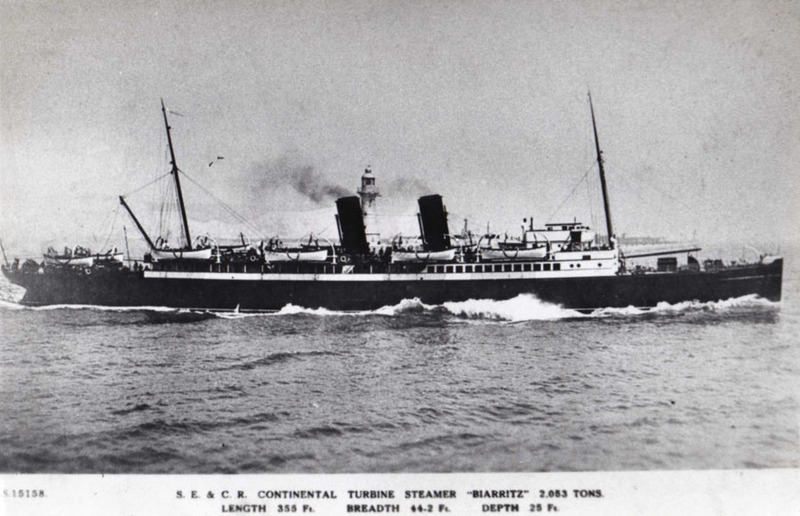 March 15th 1915: Taken over by the Admiralty and converted for high speed mine laying , initially along the Belgian coast. November 1918: Attended the surrender of the German fleet at Scapa Flow. 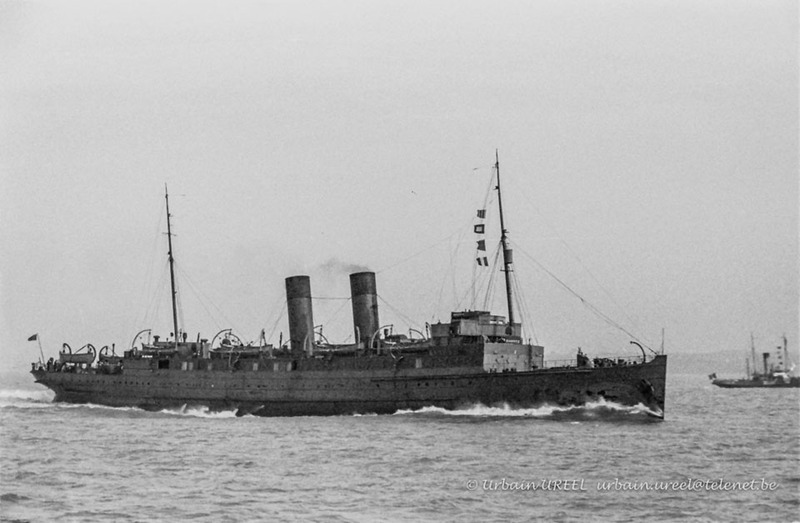 April 23rd 1919: Handed back to the South Eastern and Chatham Railway, she was subsequently used to bring British troops back from France until April 30th, 1920. May 1920: Withdrawn a few days later, the steamer was then refitted at Messrs. Vickers yard, Barrow-in-Furness. 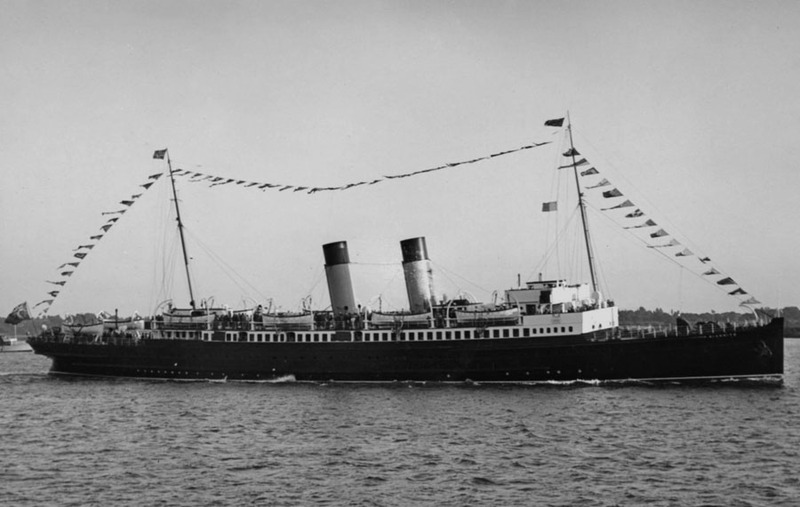 December 4th 1921: Returned to cross Channel service. January 1st 1923: To Southern Railways fleet. Dover – Calais. Commodore ship. May 1923: Carried King George V and Queen Mary to Boulogne (and back) en route to their state visit to Italy. Flew the Royal Standard at the foremast and the white ensign at the stern. Nine destroyers as escorts. November 16th 1925/1926 (winter): She was substantially modernised by Denny’s of Dumbarton in order to bring her more into line with the standards set by the new Southern Railway vessels then appearing. Converted to oil burning, funnels heightened by 1.83m/6.0 ft. Promenade deck enclosed. Extra cabins added. March 11th 1926: Returned to the south coast once more and based at Folkestone. Cost of refit £47,195. August 4th 1928: On the anniversary of the outbreak of W.W.1 carried Prince of Wales (Edward VII) to the Flanders battlefields for a remembrance service. Returned next day. August 1939 (late): Used for cross Channel trooping. September 6th 1939: Moved from her stand-by berth at Dover to Folkestone. September 9th 1939: Moved to Southampton. 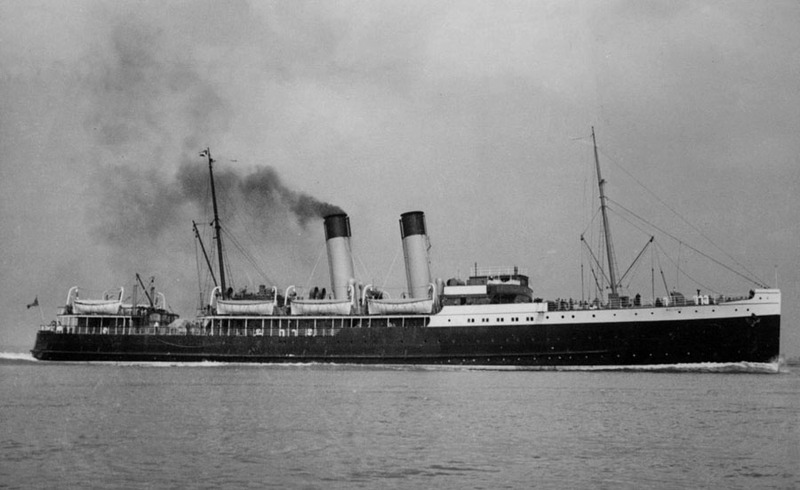 September 10th 1939: Arrived in Southampton and departed at the beginning of a series of troop crossings to Cherbourg. December 11th 1939: Reverted to Dover as the British Expeditionary Force leave ship. 1940: Rebuilt as a military transport. April 11th 1940: Directed to Rotterdam to be ready to evacuate British residents and remained there until replaced by MALINES. April 26th 1940: Under the command of Captain D G Walker evacuated Dutch officials from Rotterdam. May 21st 1940: Ceased as a leave ship. 1940: Assisted in the evacuation of Dunkerque. May 22nd 1940: She took men of the 2nd Guards Brigade from Dover to Boulogne. May 23rd 1940: At Dunkerque she was hit by sporadic German shellfire from Gravelines. May 26th 1940: Again at Dunkerque; brought out 988 troops. May 27th 1940: Under the command of Captain W H Walker en-route to Dunkerque she was again hit by intensive shelling from Gravelines. “Fireman A Philips, though severely wounded in the thigh, attempted to turn off the oil supply before reporting to Captain Baker. He died that night and was posthumously mentioned in despatches. 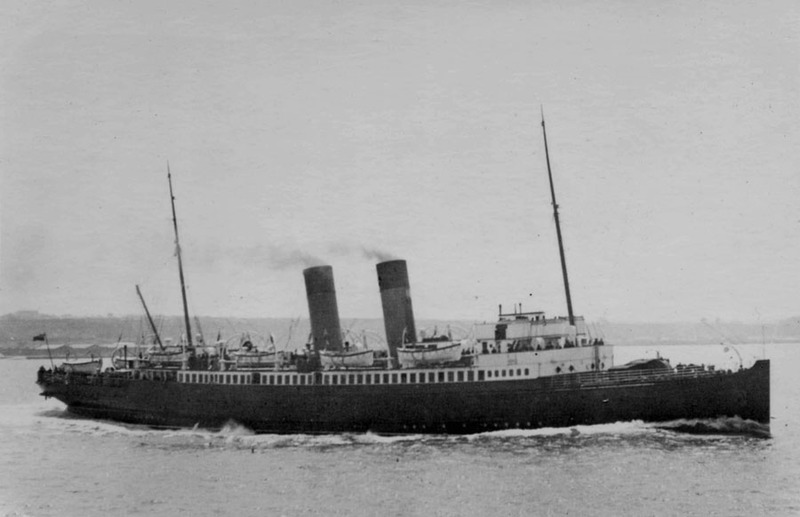 The Chief Engineer, Mr J L Crockatt, who was subsequently awarded the D.S.C., managed to maintain power to the three boilers and the ship limped back to Dover. May 30th 1940: Left for repairs in Southampton. May 29th 1940: The crew of the HAMPTON FERRY took over for the next run to Dunkerque. In all5 visits and 5,139 men were evacuated. June 15th 1940: Despatched to St Malo to return the following day with 1,498 servicemen. June 19 – 20th 1940: Brought 1,000 troops, 85 French Navy and 91 civilians out of Guernsey. 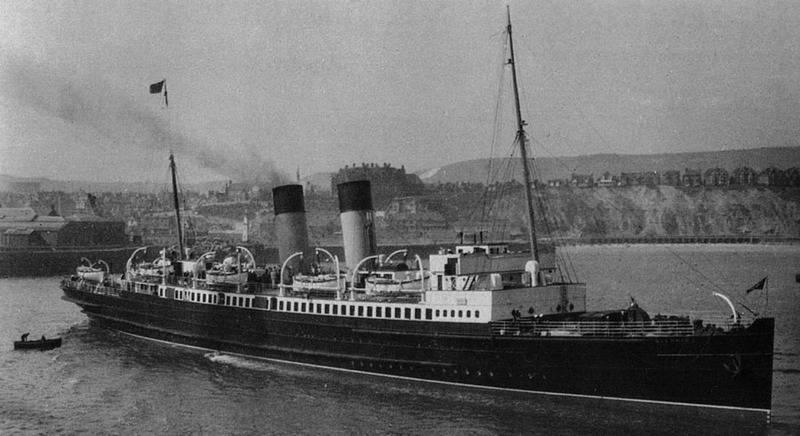 June 22 – 23rd 1940: Returned to Guernsey carrying evacuees to Weymouth, before proceeding to tha Clyde to be laid up. 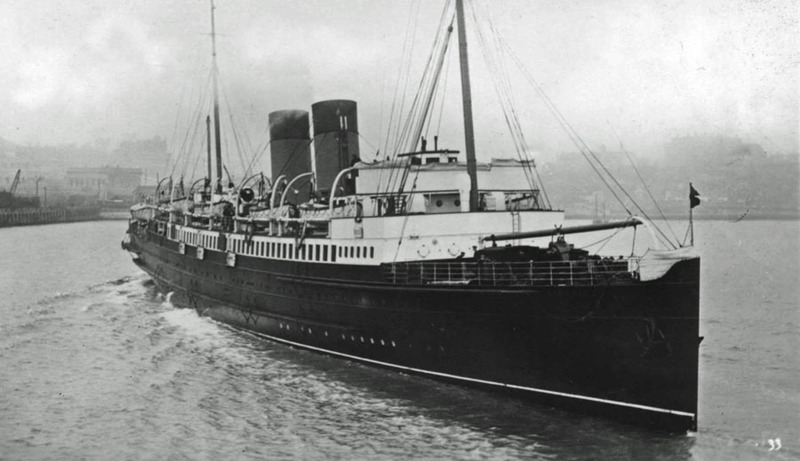 November 14th 1940: The following 13 months took her to Belfast, Stranraer, Larne, Londonderry, Glasgow, Preston and Liverpool. December 1940: Trooping between Stranraer – Larne. April 1941 – June 1941: Trooping between Stranraer – Larne. 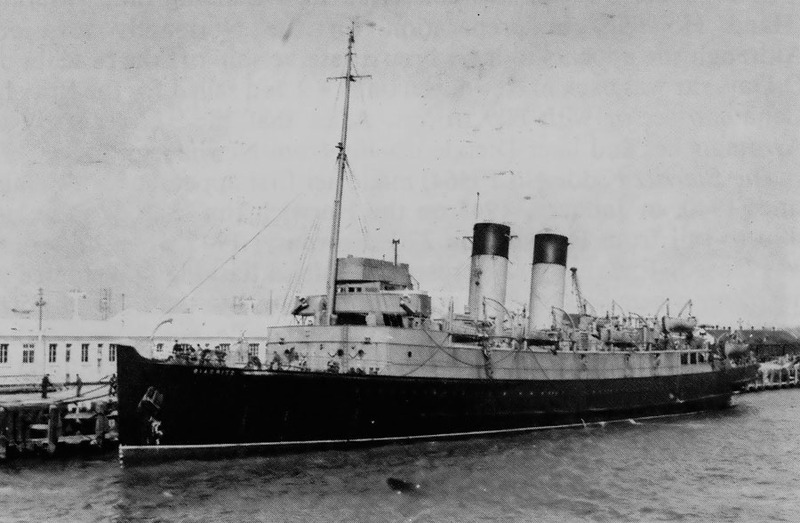 April 3rd 1941: At Larne collided with HMS TARANSAY which was at anchor off the Northern Irish terminal. 1942/43: Fleet Air Arm torpedo target ship. Converted into a Landing Ship, Infantry (Pennant number 4.96) based at Portsmouth. November 4th 1942: Arrived in the Forth to replace VIKING as a Fleet Air-Arm Target vessel. June 4th 1943: Sent to Grangemouth for refit. January 31st 1944: English South Coast for Operation Neptune, she was assigned as reserve landing ship and it was suggested that she be fitted out to function as a Rescue Ship but the idea was not approved. June 8th 1944: From Solent sailed for the British/Canadian sector with 800 troops. After that she ran regularly from Newhaven to Arromanches and later Dieppe. November 17th 1945: While undergoing refit at Swansea, damaged by HM corvette AZALEA. January 2nd 1945: Made her first appearance in Calais on the Harwich run. February 27th 1945: The last ship to sail from Harwich, when this route was closed. February 28th 1945: Arrived at Dover to take up service to Calais. During her first four week at Dover she completed 31 crossings carrying more than 70,600 troops. 1945: After the war she continued to function as a transport, carrying soldiers for the British Army of the Rhine across the Channel on behalf of the Ministry of War Transport; at first between Dover and Calais. 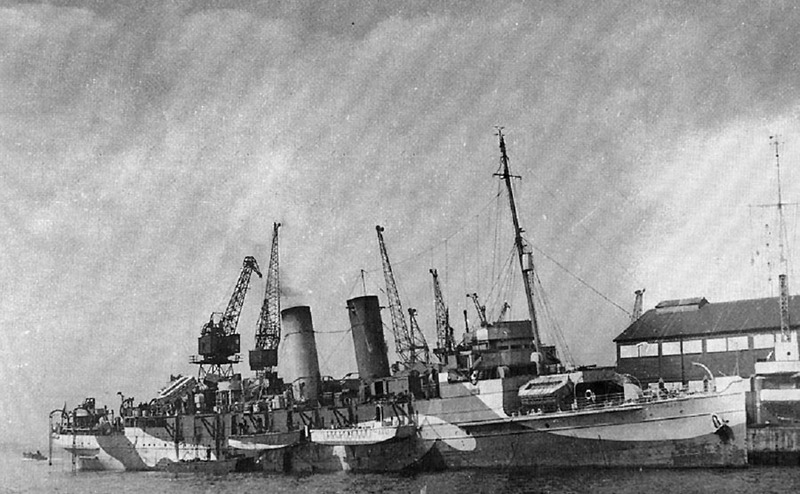 August 1949: Withdrawn being the only Dover ship to serve in both world wars. November 1949: Towed from Southampton and laid up in Wellington Dock (Dover), later moved round to the Eastern Docks for breaking up by Dover Industries. All information is believed to be correct and no responsibility is accepted for errors and omissions.